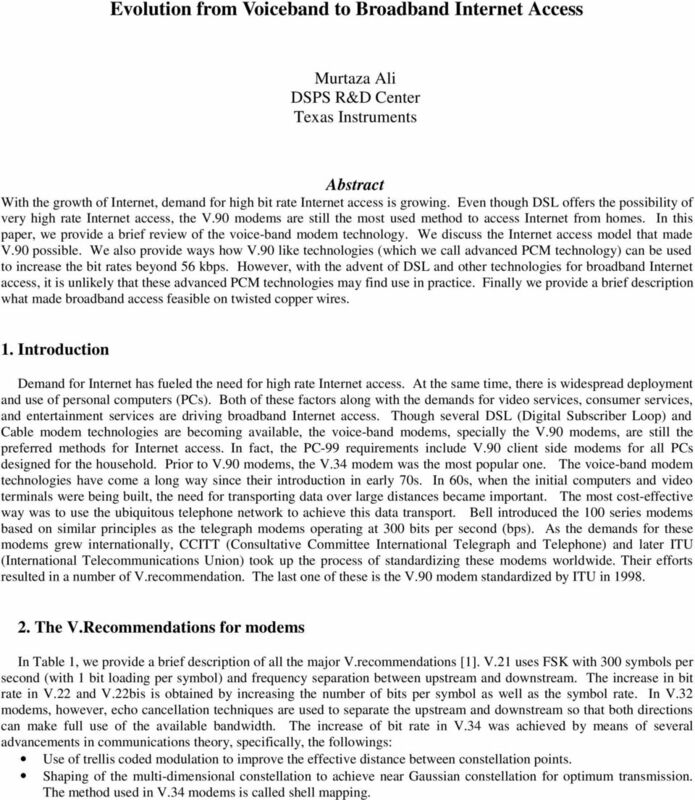 Download "Evolution from Voiceband to Broadband Internet Access"
1 Evolution from Voiceband to Broadband Internet Access Murtaza Ali DSPS R&D Center Texas Instruments Abstract With the growth of Internet, demand for high bit rate Internet access is growing. Even though DSL offers the possibility of very high rate Internet access, the V.90 modems are still the most used method to access Internet from homes. In this paper, we provide a brief review of the voice-band modem technology. We discuss the Internet access model that made V.90 possible. We also provide ways how V.90 like technologies (which we call advanced PCM technology) can be used to increase the bit rates beyond 56 kbps. However, with the advent of DSL and other technologies for broadband Internet access, it is unlikely that these advanced PCM technologies may find use in practice. Finally we provide a brief description what made broadband access feasible on twisted copper wires. 1. Introduction Demand for Internet has fueled the need for high rate Internet access. At the same time, there is widespread deployment and use of personal computers (PCs). Both of these factors along with the demands for video services, consumer services, and entertainment services are driving broadband Internet access. Though several DSL (Digital Subscriber Loop) and Cable modem technologies are becoming available, the voice-band modems, specially the V.90 modems, are still the preferred methods for Internet access. In fact, the PC-99 requirements include V.90 client side modems for all PCs designed for the household. Prior to V.90 modems, the V.34 modem was the most popular one. The voice-band modem technologies have come a long way since their introduction in early 70s. In 60s, when the initial computers and video terminals were being built, the need for transporting data over large distances became important. The most cost-effective way was to use the ubiquitous telephone network to achieve this data transport. Bell introduced the 100 series modems based on similar principles as the telegraph modems operating at 300 bits per second (bps). As the demands for these modems grew internationally, CCITT (Consultative Committee International Telegraph and ) and later ITU (International Telecommunications Union) took up the process of standardizing these modems worldwide. Their efforts resulted in a number of V.recommendation. The last one of these is the V.90 modem standardized by ITU in The V.Recommendations for modems In Table 1, we provide a brief description of all the major V.recommendations . V.21 uses FSK with 300 symbols per second (with 1 bit loading per symbol) and frequency separation between upstream and downstream. The increase in bit rate in V.22 and V.22bis is obtained by increasing the number of bits per symbol as well as the symbol rate. In V.32 modems, however, echo techniques are used to separate the upstream and downstream so that both directions can make full use of the available bandwidth. The increase of bit rate in V.34 was achieved by means of several advancements in communications theory, specifically, the followings: Use of trellis coded modulation to improve the effective distance between constellation points. Shaping of the multi-dimensional constellation to achieve near Gaussian constellation for optimum transmission. The method used in V.34 modems is called shell mapping. 2 Pre-coding techniques in which the feedback part of the equalizer is used in the transmitter. This results in no propagation of error in feedback as the transmitter knows the symbols correctly. In addition to the above theoretical developments, the availability of inexpensive digital signal processors paved the way for mass deployment of V.34 modems. 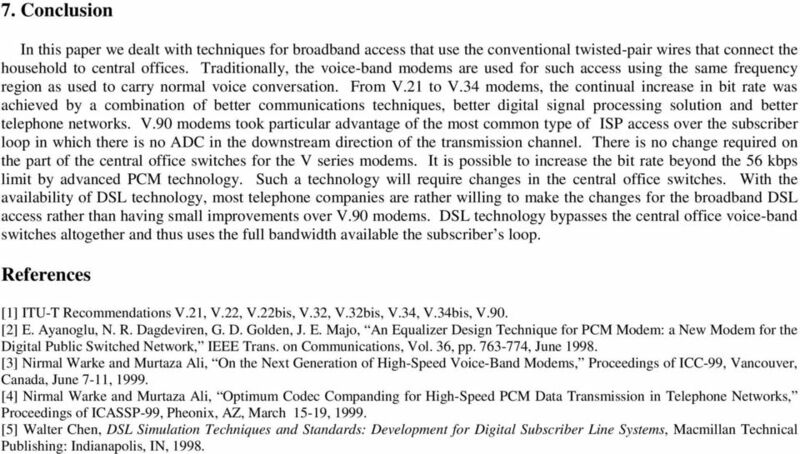 Another key issue in the development of V.34 modems was to have adaptability. In fact, the bit rate in V.34bis modem can adapt from 2.4 to 33.6 kbps in multiples of 2.4 kbps. The V.34 modem achieves bit rates very close to the Shannon limit. This is why the V.34 modem was often called the V.last modem (this was supposedly the ultimate modem). V.series Rate (bps) Modulation Full Duplex operation achieved by V FSK Frequency Separation V Phase Frequency Separation V.22bis 2400 QAM Frequency Separation V QAM Echo V.32bis QAM Echo V * QAM Echo V.34bis 33600* QAM Echo V * PCM Echo Bits per symbol * Symbol Rate (per second) Other Features * TCM, Precoding, Constellati on shaping Spectral shaping 3. 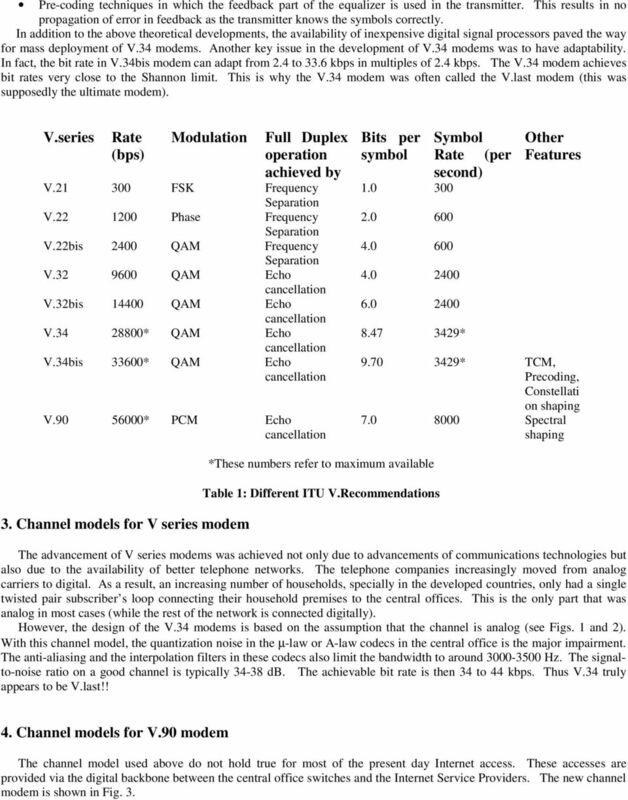 Channel models for V series modem *These numbers refer to maximum available Table 1: Different ITU V.Recommendations The advancement of V series modems was achieved not only due to advancements of communications technologies but also due to the availability of better telephone networks. The telephone companies increasingly moved from analog carriers to digital. As a result, an increasing number of households, specially in the developed countries, only had a single twisted pair subscriber s loop connecting their household premises to the central offices. This is the only part that was analog in most cases (while the rest of the network is connected digitally). 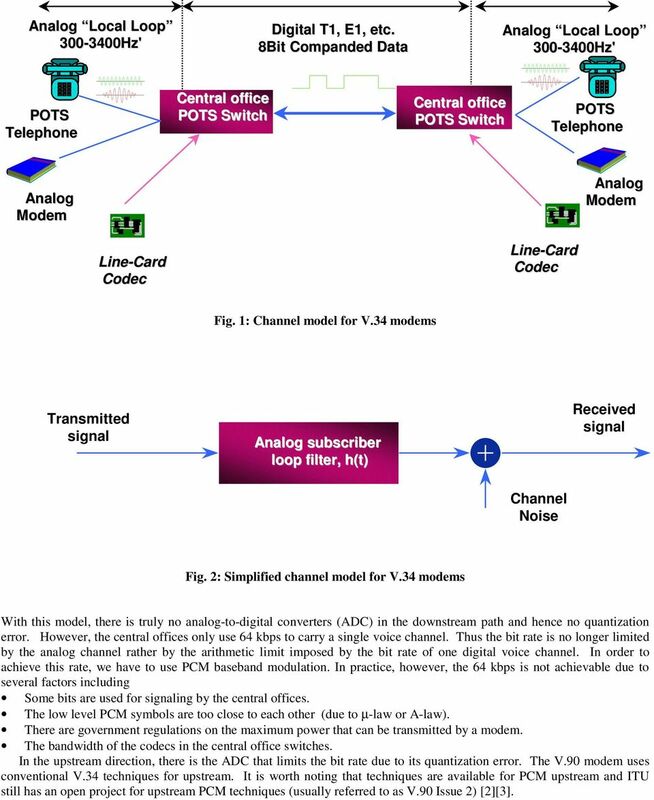 However, the design of the V.34 modems is based on the assumption that the channel is analog (see Figs. 1 and 2). With this channel model, the quantization noise in the µ-law or A-law codecs in the central office is the major impairment. The anti-aliasing and the interpolation filters in these codecs also limit the bandwidth to around Hz. The signalto-noise ratio on a good channel is typically db. The achievable bit rate is then 34 to 44 kbps. Thus V.34 truly appears to be V.last!! 4. 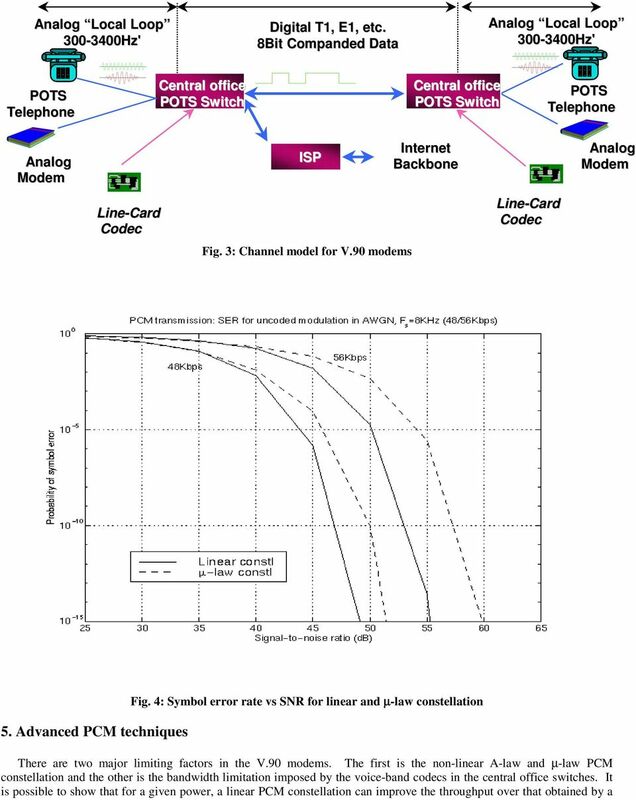 Channel models for V.90 modem The channel model used above do not hold true for most of the present day Internet access. These accesses are provided via the digital backbone between the central office switches and the Internet Service Providers. The new channel modem is shown in Fig. 3. 3 Local Loop Digital T1, E1, etc. 8Bit Companded Data Local Loop Switch Switch Fig. 1: Channel model for V.34 modems Transmitted signal subscriber loop filter, h(t) Received signal Channel Noise Fig. 2: Simplified channel model for V.34 modems With this model, there is truly no analog-to-digital converters (ADC) in the downstream path and hence no quantization error. However, the central offices only use 64 kbps to carry a single voice channel. Thus the bit rate is no longer limited by the analog channel rather by the arithmetic limit imposed by the bit rate of one digital voice channel. In order to achieve this rate, we have to use PCM baseband modulation. In practice, however, the 64 kbps is not achievable due to several factors including Some bits are used for signaling by the central offices. The low level PCM symbols are too close to each other (due to µ-law or A-law). There are government regulations on the maximum power that can be transmitted by a modem. The bandwidth of the codecs in the central office switches. In the upstream direction, there is the ADC that limits the bit rate due to its quantization error. The V.90 modem uses conventional V.34 techniques for upstream. It is worth noting that techniques are available for PCM upstream and ITU still has an open project for upstream PCM techniques (usually referred to as V.90 Issue 2) . 5 µ-law constellation . Fig. 4 shows the symbol error rate vs signal to noise ratio (SNR) for an additive white Gaussian noise channel for linear and µ-law constellations. This figure shows that depending on the rate, 3-5 db gain can be achieved by switching from µ-law to linear constellation Further by increasing the bandwidth of the codec incrementally, it is possible to use the same PCM techniques as used in V.90 to incrementally increase the access rate (in multiples of 56 kbps). Both of these techniques require changes in the codecs used in central office switches used for voice-band traffic, though these changes would be very nominal. Of course, in order to transmit more than 64 kbps through the digital network, it is necessary to use more than one digital voice channel. 6. DSL Techniques The only bandwidth limitation for access to Internet is the filters in the line card codecs. It is therefore natural to ask what is the bandwidth and the corresponding capacity for the subscriber s loop. The answer is that it depends on the distance of the household premises from the central office switch (length of the loop). In Fig. 5, we show the downstream capacity as a function of loop distance (based on 24 gauge wire). 8 Downstream Channel Capacity vs. Distance 7 6 Mbits/ sec Distance (1,000 feet) Fig. 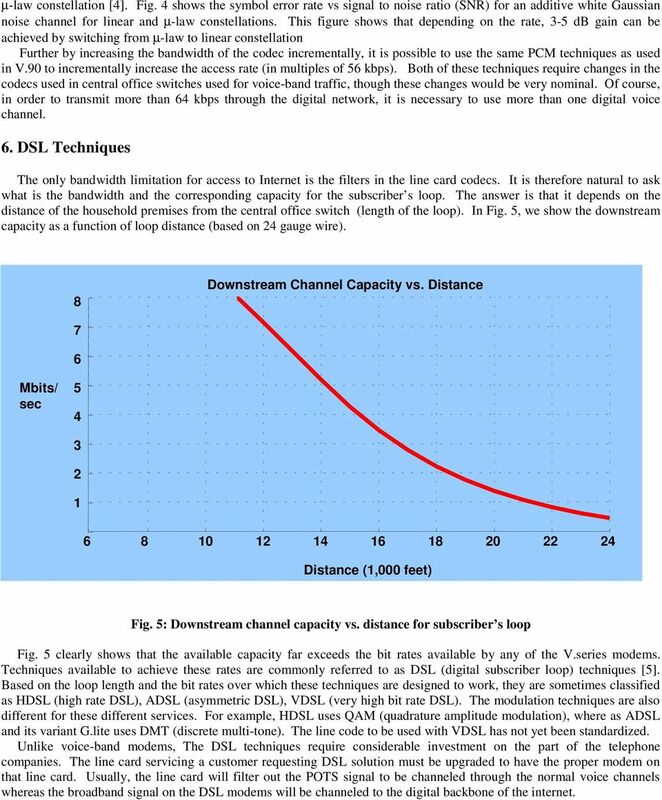 5: Downstream channel capacity vs. distance for subscriber s loop Fig. 5 clearly shows that the available capacity far exceeds the bit rates available by any of the V.series modems. Techniques available to achieve these rates are commonly referred to as DSL (digital subscriber loop) techniques . Based on the loop length and the bit rates over which these techniques are designed to work, they are sometimes classified as HDSL (high rate DSL), ADSL (asymmetric DSL), VDSL (very high bit rate DSL). The modulation techniques are also different for these different services. For example, HDSL uses QAM (quadrature amplitude modulation), where as ADSL and its variant G.lite uses DMT (discrete multi-tone). The line code to be used with VDSL has not yet been standardized. Unlike voice-band modems, The DSL techniques require considerable investment on the part of the telephone companies. The line card servicing a customer requesting DSL solution must be upgraded to have the proper modem on that line card. Usually, the line card will filter out the signal to be channeled through the normal voice channels whereas the broadband signal on the DSL modems will be channeled to the digital backbone of the internet. 6 7. Conclusion In this paper we dealt with techniques for broadband access that use the conventional twisted-pair wires that connect the household to central offices. Traditionally, the voice-band modems are used for such access using the same frequency region as used to carry normal voice conversation. From V.21 to V.34 modems, the continual increase in bit rate was achieved by a combination of better communications techniques, better digital signal processing solution and better telephone networks. V.90 modems took particular advantage of the most common type of ISP access over the subscriber loop in which there is no ADC in the downstream direction of the transmission channel. There is no change required on the part of the central office switches for the V series modems. It is possible to increase the bit rate beyond the 56 kbps limit by advanced PCM technology. Such a technology will require changes in the central office switches. With the availability of DSL technology, most telephone companies are rather willing to make the changes for the broadband DSL access rather than having small improvements over V.90 modems. DSL technology bypasses the central office voice-band switches altogether and thus uses the full bandwidth available the subscriber s loop. References  ITU-T Recommendations V.21, V.22, V.22bis, V.32, V.32bis, V.34, V.34bis, V.90. E. Ayanoglu, N. R. Dagdeviren, G. D. Golden, J. E. Majo, An Equalizer Design Technique for PCM : a New for the Digital Public Switched Network, IEEE Trans. on Communications, Vol. 36, pp , June  Nirmal Warke and Murtaza Ali, On the Next Generation of High-Speed Voice-Band s, Proceedings of ICC-99, Vancouver, Canada, June 7-11,  Nirmal Warke and Murtaza Ali, Optimum Companding for High-Speed PCM Data Transmission in Networks, Proceedings of ICASSP-99, Pheonix, AZ, March 15-19,  Walter Chen, DSL Simulation Techniques and Standards: Development for Digital Subscriber Line Systems, Macmillan Technical Publishing: Indianapolis, IN, 1998. Black Box Corporation 1000 Park Drive Lawrence, PA 15055-1018 Tech Support: 724-746-5500 www.blackbox.com e-mail: info@blackbox.com V.
Exam questions. 1. Which of the following are true regarding xdsl? Choose three. It uses a portion of the existing phone line. la The Tour Marine Tanguy, Drive,, Brest Mumbai. (FR). Characterization of a new copper cable for next generation DSL systems Project Co-ordinates ordinates Kalpesh PATEL TELECOM ParisTech Paris, France.